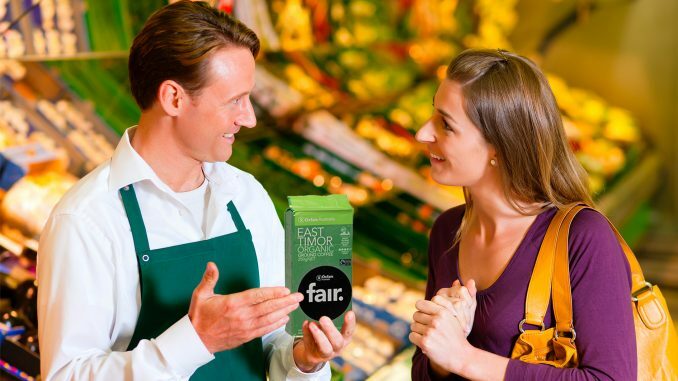 SAN FRANCISCO—The Associated Press reported Friday that a local grocery shopper, Jenny Haberman, had her concerns about fair trade coffee alleviated by Henry Gaglio, a Whole Foods clerk. Gaglio was able to reassure Haberman that the trade ranged from fair to fantastic for all parties except the customer. “Rest assured that everyone in this trade is making out like bandits except for you,” Gaglio said. Gaglio explained to Haberman that the coffee bean growers and traders enjoyed many times their normal pay and even the donkeys that carried the coffee from the orchards to the processing plants were given 300 thread-count blankets. These expenses are passed along to the customer, who reportedly can feel satisfaction that they are the only party in the trade getting fucked over a barrel. Haberman was reportedly happy with Gaglio’s explanations and purchased two pounds of Jamaican Blue Mountain beans for $67.